Troubling indeed. I wonder. If Christians are loving, will not the world be more accepting of them? If Christians are more loving to one another, surely, the Church will grow? If Christians share more of their love, should there not be a decrease in negative sentiments, but a growing positive acceptance? Before we start to be defensive about it all, maybe, we need to take a pause and to look into the mirror first. This is something that all people need to do, not just Christians. That said, as ambassadors of the gospel, it is vital that disciples of Christ regularly examine themselves in the light of God's Word, and not fall prey under the microscope of worldly expectations. This week, I like to pose the question: What is the essence of small group health? What does it take to be more loving in our communities of Christ? I like to hone in on one word: Giving. Just before John records the famous commandment of love, we read in John 13 about Jesus who is aware about his hour having come for him to leave the world. Instead of going through a laundry list of touring round the world in 80 minutes, or to fulfill last dying wishes, he spends time eating and meeting with his disciples. John even records, "... he loved them to the end." In the movie "The Bucket List," two terminally ill men make a road trip to try to fulfill their dying wishes, where they try to make their remaining days count. 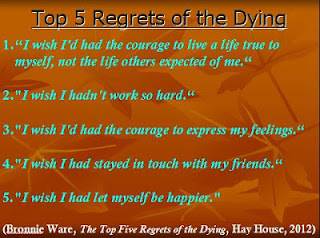 It is the list of things they want to accomplish before they kick the bucket and die. They go round the world, drive fast cars, skydive, visit exotic places, and soon, they begin to work on things of the heart, like relationships and love in the family. Key to their last days is how the two men spend time with each other and make time for their loved ones. Time is a tough commodity to give up nowadays. People are too busy with their own stuff to even bother about giving it away. That is why the words "Wasting time" tends to be said when nothing seems to get done. In small groups, when we go for meetings, sometimes when we do not feel like we have gained anything, we get upset, and even use the words "wasting time" to describe the entire meeting. I prefer to see it otherwise. For in going to small group meetings, it is not about doing things, but doing things TOGETHER that matters. It is not about being there, but being there for one another that matters more. It is the giving of our time that is our way of saying: "Our time is more important than my own time." POINT: Jesus gives of his time, even in his dying hours. Shall we not give time for one another in our living days? Money can be a touchy issue. Sometimes, a dispute over how much to give or how the money is spent can create tensions and even split groups. Money is a key factor in Judas's betrayal of Jesus. Judas is the treasurer for the group, and so when Jesus asks him to do quickly what Judas had planned to do, the disciples thought that Jesus was asking him to buy things for the festival or to give something to the poor. Little do they know that Judas had something sinister in mind. Against this backdrop of money and ill-gotten gains, we read about way money can tempt us. It tempts Judas to even want to betray Jesus. Remember that Judas was the same one who were among those who criticized the woman who broke the alabaster jar in order to anoint Jesus with fragrant oil. I know that of many groups that exist simply because of generous people in the group. They offer their houses for meeting places. They prepare lavish dishes for people. They put out their best for the group. When it comes to giving, it is not the quantity that matters, but the quality of what they give. In fact, the quality and quantity comes out of this one fact: A Big Heart. The woman with the alabaster jar and the expensive perfume has Jesus praising her saying: "Truly I tell you, wherever this gospel is preached throughout the world, what she has done will also be told, in memory of her." In small groups, the bigger the hearts of people, the greater the willingness to give of one's money and resources, both in quantity as well as quality. POINT: Healthy Christian Communities will have a healthy level of giving, both quantity and quality. Jesus washes his disciples' feet. 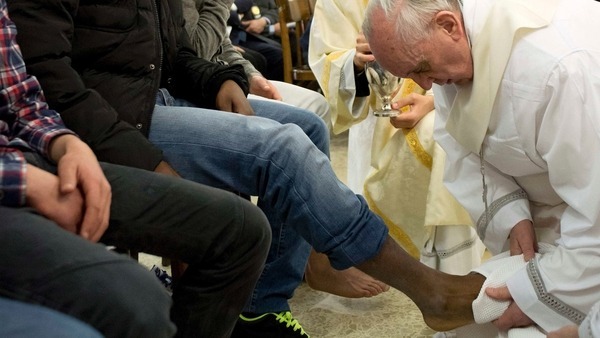 On Easter, the new Pope Francis is pictured washing the feet of non-Christians, even kissing them. It has generated lots of applause and approval, that the new pope is going to be more acceptable than the previous one. Washing the feet of people is a powerful demonstration of recognizing that we are called to be servants of God. A servant of God is not one who expects things to be done for him or her. A servant of God is one who puts upon himself or herself to do things for others. We live in a culture where we expect to be served. Whether we are waiting at the bank tellers or queueing up to buy tickets from the manned counter, we expect service to be done quick and fair. For those of us with domestic servants, we expect to be served our meals on time and to our tastes. We expect our houses to be cleaned properly. We expect the to serve us according to our expectations. In Christian communities, it is easy to bring such expectations and apply them to other members of the group. Why not apply that expectations on the self first? POINT: Healthy Christian Communities expect more from the self to give through service, than to expect others to serve you. Jesus washes the disciples' feet. So should we through the giving of our service to them. Jesus has said that greater love has no man, than one who is willing to lay down his life for his friends. If that is so, what about dying for our enemies? Jesus has demonstrated exactly that by dying for the sake of the whole world. When we give of our lives, we give of ourselves. 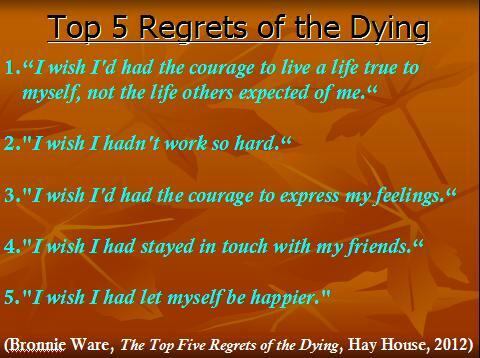 Bronnie Ware recently published a book about the five top regrets of the dying. Note that nearly all of them have to do with relationships. The first is about living a life true to self. If we are not living to bless others, we are certainly not being true to our calling. The second is about regretting working too hard. Why? It is because most of the time, working too hard means accumulating accomplishments for self. Third, courage to express one's feelings is about honesty. Relationships need that. In Christian communities, we are called to do something more: Speak the truth in love. Four, staying in touch with friends is vital. Finally, true happiness lies not in taking stuff for self, but in giving of our lives to others. POINT: If Christ has given us his all, why can't we begin our giving with what we have? My readers. Are you a part of a small group or a Christian community? Do you feel like you want to begin a positive change for the group? Do you want to be the loving community that Christ has called us to build? Give of your time. Give of your money and resources. Give of your service. Give of your life. For in giving, we shall receive even more. The crux of the matter is this. The more we give, the more we realize that the Lord will be pleased. The essence of healthy small groups is in this one word: Giving. You have said it well with many truths. Will pray these things we'll do and do them well!